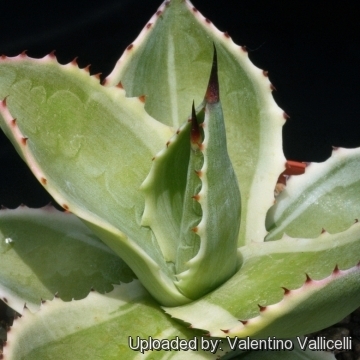 Accepted Scientific Name: Agave mitis cv. Multicolor hort. 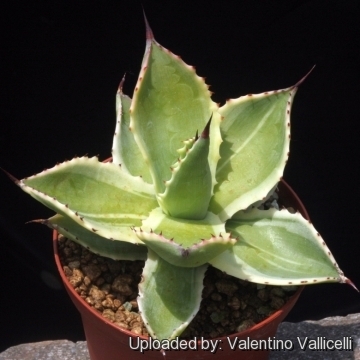 Description: Agave mitis 'Multicolor' (aka: Agave celsii 'Multicolor', 'triolor', variegata or forma 'marginata') is a medium sized architectural mostly solitary agave. Neverthless this variegated cultivar shows valuable differences in habit with the standard Agave celsii suggesting that it may be a hybrid with Agave potatorum, but it is hard to be sure about the true genealogy of the plant. Rosettes: Compact, slowly growing, about 55-75 cm tall and 60-90(-120) cm broad. Leaves: Fleshy, broad, gracefully boat shaped, curved upwards, almost harmless, 15 cm wide and 60 cm long, with a broad, medium-green to glaucous central zone bordered with a creamy-white or light yellow edge. The margins of the leaves are also lined with a row of minute evenly spaced, purple-black teeth and a soft terminal spines. Cool and dry weather or strong exposition to sunlight will produce a pinkish or reddish tinge on the leaves making it multicoloured. Flowers: Similar to the species with a 1,2-1,8 m tall unbranched spike bearing red tinged green flowers congested on the upper third of the spike. 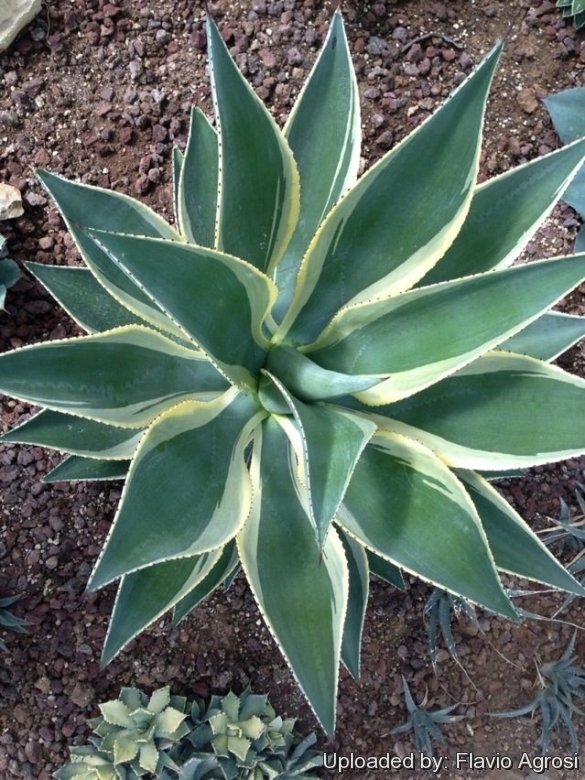 Note: Due to problems with the types specimen of Agave celsii being improperly documented, the name was switched to the properly documented specimen, Agave mitis. 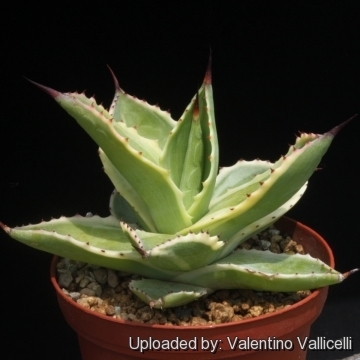 1) San Marcos Growers contributors “Agave celsii 'Multicolor'” San Marcos Growers <http://www.smgrowers.com>. Web. 27 Sep. 2014. 5) Wikipedia contributors. 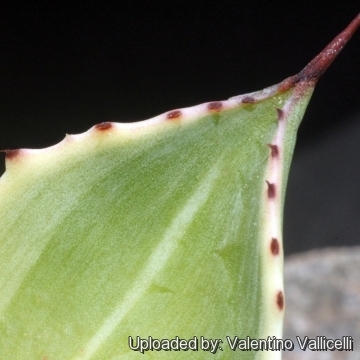 "Agave mitis." Wikipedia, The Free Encyclopedia. Wikipedia, The Free Encyclopedia, 7 Dec. 2014. Web. 15 Dec. 2014. Cultivation and Propagation: It is a relatively easy-to-grow species, though not as cold-hardy as many of the more northerly-occurring species (Winter hardy to around -3° C degrees, or less for short periods) But it is best to protect it from frost to avoid disfiguring the foliage. Suited for light shade to full sun, but better with some shade in summer. It needs a very well-drained soil. It grows fairly fast in summer if provided with copious water, but allow to dry thoroughly before watering again (the more water and fertilizer this plant gets, the faster it will grow). During the winter months, one should only water enough to keep the leaves from shrivelling. It does great in containers. Plants cultivated outdoors are more drought tolerant, and can take some heat and some sun. Remove eventual suckers to show of the beauty and form of the individual rosette. Propagation: By micropropagation or suckers (seldom available). Remove the basal suckers in spring or summer and let the cuttings dry for a few days before inserting in compost.. only problem is the logistics of getting to the suckers - very sharp spines and suckers usually right up against, or underneath the mother plant. Uses: These striking plants are wonderful when used for accent or simply to provide some all year round foliage colour and often used in a pot as a patio plant, they make an eye-catching statement and along with other evergreen plants in pots, can be moved around to change the scenery or position to give more shelter.